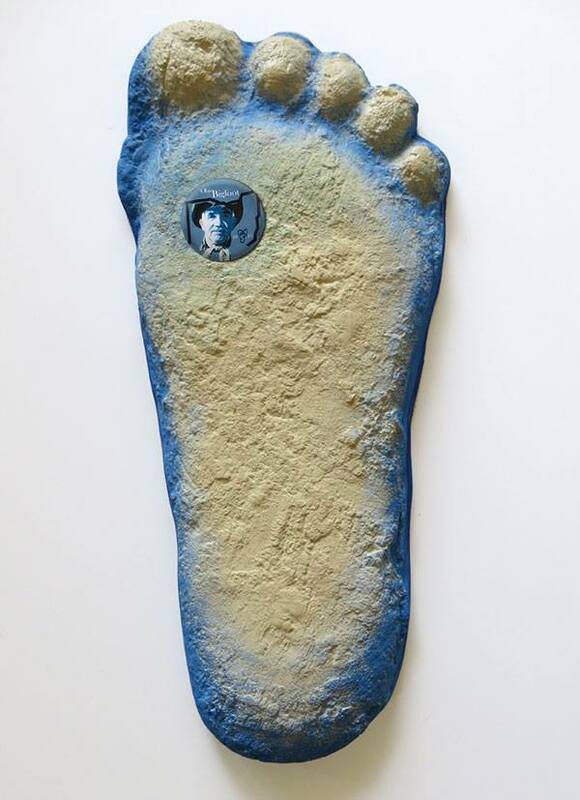 Michael Esordi has produced many Bigfoot-related items for years. 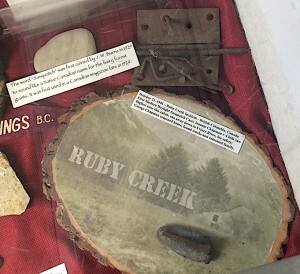 He even created for the International Cryptozoology Museum an exhibit item memorializing his, my, and associate Brad Pennock’s 2013 exploration of the Ruby Creek, British Columbia 1941 Sasquatch sighting site. In 2017, it seems appropriate that the Bigfoot community would look forward to what Michael would create this year on the occasion of the 50th anniversary of the Patterson-Gimlim Bigfoot footage. 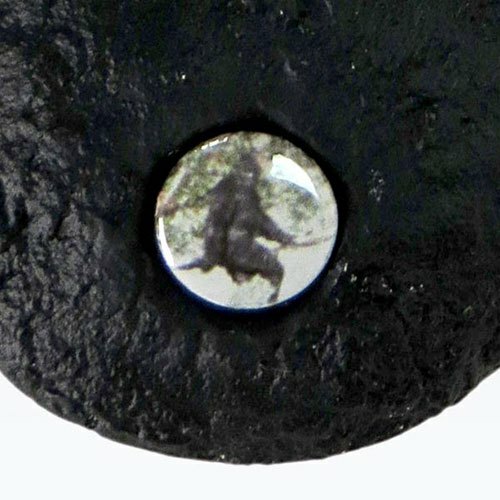 As will be recalled, Roger Patterson filmed a female Bigfoot strolling across the blue clay sandbar at Bluff Creek, California, on October 20, 1967, as Bob Gimlin held his rifle and the horses nearby. 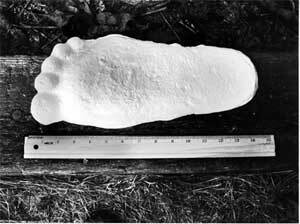 Soon afterward, ten good footprints were cast with plaster as a permanent record of the trackway left behind by this Bigfoot. 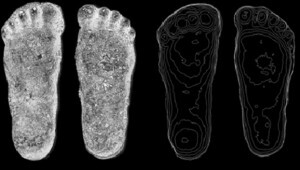 One footprint became the most clearly imprinted. It was the one most copied and shared with hairy hominoid researchers and Bigfooters. 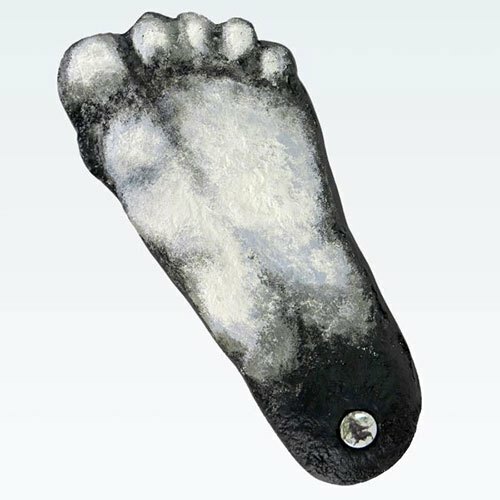 I called this, previously, on Cryptomundo, the “World’s Most Recognized Bigfoot Cast,” in a April 5, 2010 posting. Michael took that preserved item and made it into a golden remembrance of that event. 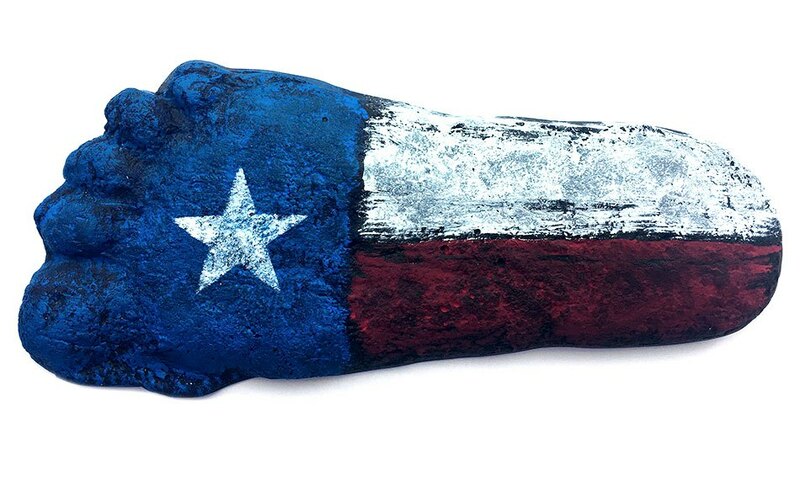 Selling it now online (here), you will be able to obtain these casts directly from Michael at the Ohio Bigfoot Conference, May 19-20, 2017, in Lore, OH; at the Texas Bigfoot Conference October 7-8, 2017, in Jefferson, TX; and at other conferences around the country. 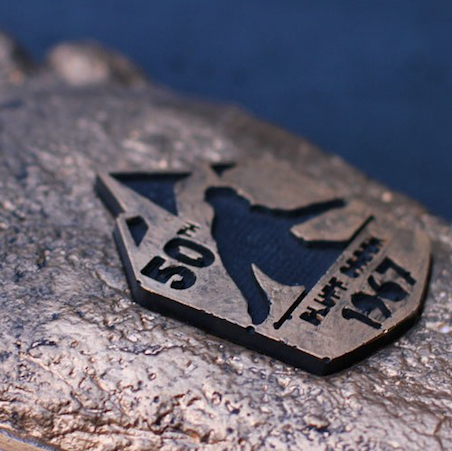 Here are some other photographs of Michael Esordi’s commemorative creations. 2017 marks the 50th anniversary of the Patterson – Gimlin Bigfoot Film taken on October 20, 1967. 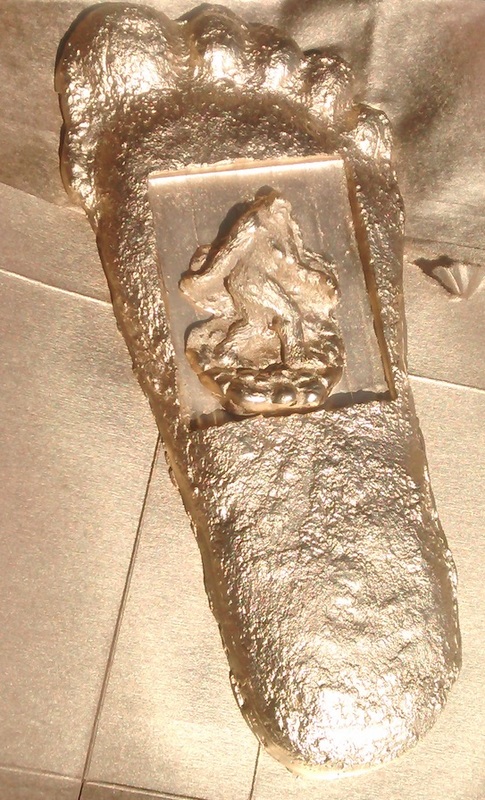 Gold is the cool of 50th anniversaries, so it is only fitting to have a gold version of the Patterson – Gimlin cast. 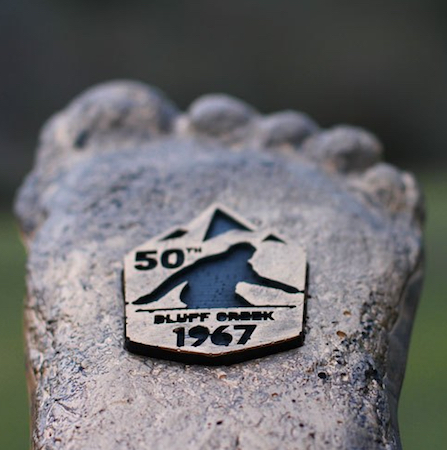 Making it extra special we created a special Bluff Creek emblem which is inlaid into the cast. Each one is hand painted and given a distressed, aged look by antiquing the gold and roughening up the emblem. 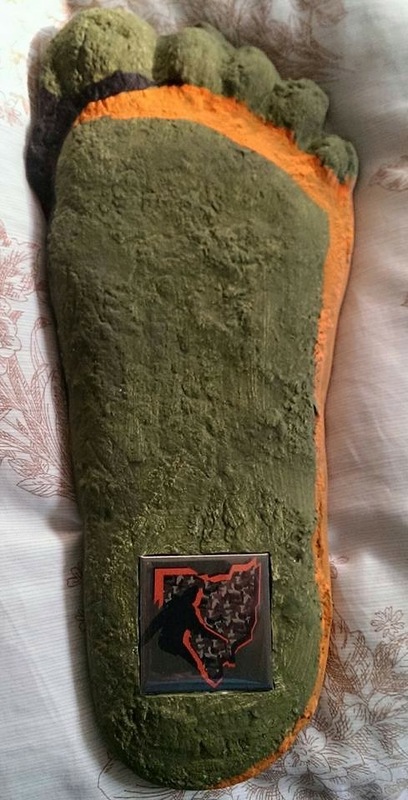 A wonderful collector’s item for Bigfoot enthusiasts. There are many different versions of this famous cast that have been produced by Michael Esordi in the past. Michael’s casts and products have been made possible at conferences and other functions supported by Marc DeWerth, Craig Woolheater, and Loren Coleman. They are all rare collectibles today. Michael is to be congratulated for this new 2017 artistic item – painted in gold. 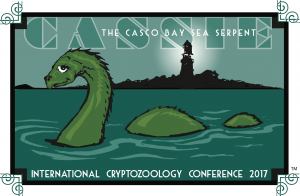 Consider being a vendor or sponsor for the Second Annual International Cryptozoology Conference in Portland, Maine, Labor Day Weekend, 2017, September 3, 2017. Not to be confused with the Tewksbury gold casts. By pure coincidence, the International Cryptozoology Museum has been creating and awarding “The Golden Yeti” award to be bestowed to its “Cryptozoologists of the Year,” for a few years. 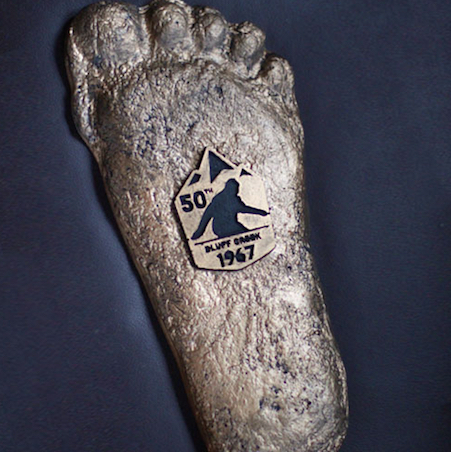 In line with this being the 50th Anniversary of the P-G Film, the ICM presented one time P-G Filmway golden casts to Bob Gimlin and the entire Finding Bigfoot cast (Matt Moneymaker, Cliff Barackman, James Fay, and Ranae Holland). They were created by ICM staff member Jean Tewksbury. These were given to Bob, Matt, Cliff, Bobo, and Ranae by Loren Coleman, at the Finding Bigfoot Festival in Willow Creek, California, on April 29, 2017.